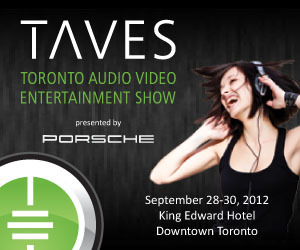 The second annual TAVES Toronto Audio Video Entertainment Show will begin next week and we’re excited about it! Please come and see Audioscape at Room #833 to enjoy some Award Winning Audio! 1) The Absolute Sound’s Editor’s Choice Awards System…….earlier this year, The Absolute Sound magazine announced the winners of their annual “Editor’s Choice Awards”….the products that the editor’s themselves would bring home for their enjoyment….this is quite the award and honour! This year, Audioscape is so proud of their SEVENTEEN award winners that they have put together a complete high end system composed of many of our winners, wait ‘til you hear this system! 2) Listen to the fine array of USHER loudspeakers driven by the newest PrimaLuna ProLogue Premium Integrated Amplifier…..the Mini Dancer One, Mini Dancer Two, BE -718 monitor and the first showing in Canada of the new MINI-X bookshelf monitor, be among the first in North America to hear this speaker! 3) Meet Joe from JPS LABS and have all your questions answered about speaker cables, interconnects and power cords….the best sounding, best value line in the market! 4) Check out our display of DUAL fully automatic turntables, dust off your vinyl and enjoy LP’s again! 5) Visit their clearance area, special sale prices direct to the public on some very special, select products, don’t miss this, BIG savings! Phil, Brian and Alan are looking forward to meeting you, and don’t forget to get your free Usher demo cd at their display (while supplies last). This entry was posted in DiaLogue Premium, DiaLogue Series, Distributors, ProLogue Premium Series, Shows and tagged audio, electronics, hifi, music, primaluna, tube amplifier. Bookmark the permalink. Wow Allan… some nice systems on display! I wish I could make it to Toronto to hear them and visit with you guys. All the best for a great show. I look forward to photos and a recap.